← Camp NaNo Update – Need More Words! A weekly blog hop where writers come together to talk about whatever inspires them. Join us! Hello all! I’m finally back for another go of Thursday’s Children, a weekly blog hop in which writers share the things that inspire them. After a long and stressful couple of weeks, today’s post is going to be short and sweet. The inspiration that I’m writing about today comes from a single item – my first and so far only piece of fan art (which, considering the number of people who have read my work, is pretty good). Needless to say, I was so excited by this that it became a source of massive inspiration for me. On the NaNoWriMo forums, I found a thread where people were asking about each others ‘writing totems’, something that until last year I had not heard of before. From the Wikiwrimo entry, a writing totem is “an item (or several items) that helps inspire, get one in a writer-like state of mind, and help battle writer’s block” which can be anything that inspires you and your story. At the time I couldn’t think of anything that fit the bill but I loved the idea of a writing totem. 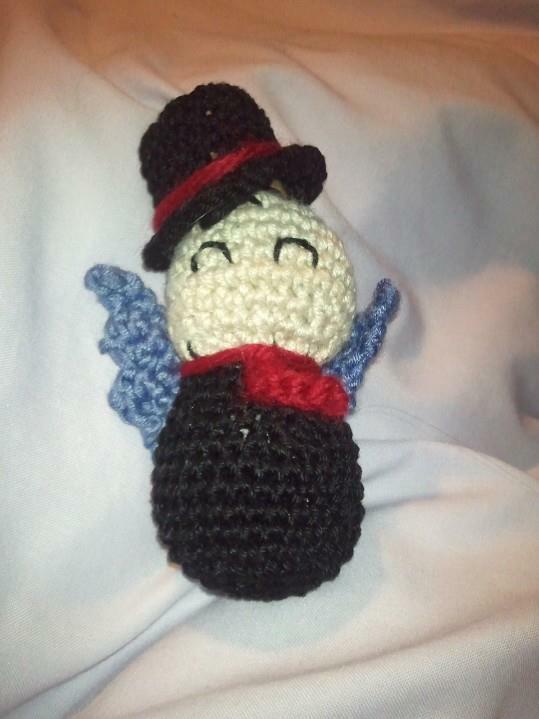 And then as a Christmas gift, my best friend and beta reader gave me a crochet doll of one of my characters. To say that I was absolutely delighted was an understatement. It made me so happy to think that one of my characters stuck with her enough that she knit him to life. Whenever I see it, I remember how I felt when I first saw it. Inspired. So here is Tony – gangster, vicious, crocheted. Fear him in his adorable glory! Now here is the linky you’ve all been waiting for! Go forth and read some awesome posts! This entry was posted in Inspiration and tagged Fiction, Inspiration, NaNoWriMo, Writing. Bookmark the permalink. I don’t have a writing totem, but I have a writing kitten who hangs by me while I work. Does that count? Haha, I like to think so! Though I’m not sure how inspiring a cat’s bum on the keyboard is, as this is the only place my own cats choose to try and sit. Oooo, that sounds like a great idea for a writing totem! I love the beach! I have different totem for each of my novels. I keep them by my desk. They inspire me and help me when I shift from one project to another. Ooo that’s a good idea to have different ones. I have a horror project that I plan on starting soon so a different totem is a good plan. Light hearted fantasy to grim horror is such a huge jump, I need to make sure I’m in the right frame of mind! I keep a file on my desktop called “brag file” for when I get especially awesome feedback I’ll need on those days when I hate every word that comes out of my fingertips. Love, love, LOVE your totem! !